I know you. You pride yourself on doing things the right way, the ethical way, the efficient way. You know exactly what your competitors do wrong and avoid their pitfalls. You focus on providing real value to your clients – whether or not that means a bigger paycheck for you. Your clients speak highly of you (I know, because I’ve interviewed hundreds of them). They praise your dedication and your trustworthiness and how smart and strategic you are. But when I talk to you about how to communicate your value to prospective clients, you get all Awww shucks ma’am, t’weren’t nothin’. You say things like “we don’t want to look like we think we’re smart” or “we don’t want to brag”. Buckle up, I have some real talk for you. You have got to stop with this humble aw-shucks nonsense. 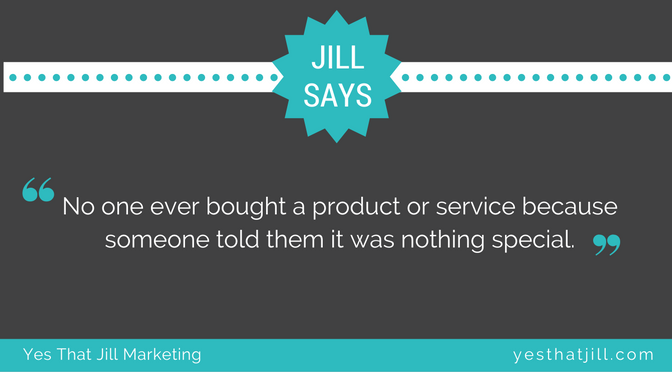 Have you ever bought a product or service from someone because they told you it was nothing special? Look, I get it. You think the way you do things – all that ethical, efficient, real value stuff – is just the way things should be done. And you’re right! It should be. But it’s not the way things are done. Your competitors are not operating that way. Which is exactly why your clients rave about you. They’ve had experiences with others and they know you’re leagues ahead. They absolutely trust you in a way they don’t trust your competitors. They straight up value you more – otherwise they’d be with the other guy. Your existing clients know what you bring to the table. Your prospects don’t. You’re already serving your clients well – don’t let humbleness stop you from serving your prospects well too. You don’t have to take out a full page ad in the paper that says WE’RE AWESOME. But if you let a misguided sense of modesty stop you from pursuing opportunities to show people what you’re made of, you’re not just torpedoing your own growth, you’re making life harder for your prospects. So grab that horn and toot it. Just a little. This post is part of my Screw Advertising series, created especially for entrepreneurs with service businesses. You can find my first post, 7 Golden Rules to Turn Clients Into Raving Fans, right here.